An old Texas recipe for cream pies. Back when the University of North Texas was still North Texas State Teachers College, my grandmother (Ann Henderson, or Mimi as we call her) entered their home economics program and refined the cooking abilities she had learned from watching her mother. Recently, I visited my grandparents' ranch between Bridgeport and Weatherford, and Mimi pulled out the textbook used in her cooking classes in 1949: Practical Cookery and the Etiquette and Service of the Table. The pages in Mimi's copy of Practical Cookery with the most splatters from obvious use through the years are the ones in the section on cakes and pies. Turning the pages of this book is like stepping back to an earlier era, one where good table manners involved more than not texting or checking email during a family meal, one where keeping a well-managed house took physical labor and ingenuity. The first section of the textbook establishes the setting perfectly: "Structure and Management of Cook Stoves and Ranges," starting with coal stoves and moving into an explanation of the advantages of using gas over coal or wood as a fuel. The students were expected to come to cooking class dressed in starched and ironed uniforms similar to a nurse's uniform of that era, and they learned to make desserts without the aid of electric mixers. Good old rotary mixers and whisks, along with plenty of arm strength and a fair amount of patience, were all they needed to whip up the toppings for their cakes and pies. The lessons Mimi learned in the classroom at North Texas were a continuation of knowledge gleaned from her mother as a young girl. She says her mother was too busy running the house to actually teach her to cook, but she spent years observing her and her two older sisters at work in the kitchen. When I ask her how to make the different dishes and desserts she is now known for, she often hedges her response with statements like, "Well, Mother always did it such-and-such way, and Jessie Lee did it so-and-so, but I like to thus-and-thus." I want to learn the way to make pies, but even in her explanation of the steps, Mimi seems to be telling me there's not one perfect way to do it -- rather, I should learn the principles behind the process, then find what works best for me. Make it my own. Practice. Put together dozens of pies, and I'll figure out my pie-making style. The authors of Practical Cookery may have intended pies and cakes and coal ranges to be a science taught in a college classroom, but beyond the fundamentals, baking is an art form. Mimi's talent as a culinary artist is well-known throughout Wise County. She was chosen as Cook of the Week by The Bridgeport Index, and her desserts are among the regular big money-makers at local charity auctions -- her Italian cream cake once fetched $650 in donations for the Boonsville Volunteer Fire Department. As someone wishing to learn more about baking from scratch, I couldn't apprentice myself to a better master. Henderson family gatherings aren't complete unless Mimi makes at least one of her cream pies topped with meringue. Now that she is nearing her 79th birthday, she is slowing down a little -- only a little -- in her baking, and there has been talk among my aunts and cousins about the need for someone to get serious about letting Mimi pass down her pie recipes. And not only the recipes -- that's just writing on a notecard. We need someone to spend dedicated time in the kitchen with Mimi, watching her, imitating her, getting feedback from her about how to do things better the next time. She has been cooking for 60 years, and her knowledge and gifts are too precious to be lost because we didn't take the time to let her teach us. So I appointed myself the member of the younger generation who will learn how to make Mimi's basic cream pie recipe. It can be modified to make chocolate, coconut, or banana cream pies topped with meringue. After a full day in the kitchen with Mimi and six pies to show for it, I feel confident enough to be the one to bring dessert to the next family gathering. In a medium bowl, mix flour and salt. Add 1/2 cup shortening (or "fat," in the language of Practical Cookery) and mix until the shortening is in tiny balls smaller than peas. You can mix it into the flour with a pastry blender, a fork, or two knives, but Mimi uses her electric mixer, perhaps in an effort to make up for lost time from the days when she was making meringues with a whisk. Add the ice cold water to the flour mixture, and mix until you have a ball that's dough consistency. Mimi said she couldn't tell me how much water to use -- she just pours it from a glass while the mixer is going and stops adding water when it looks right. I found 6 tablespoons, plus or minus a little, works well for me. Roll the dough out on a floured surface until it's big enough to cover the bottom and sides of a 9-inch pie pan, and carefully transfer the rolled pastry to the pan. Crimp the edges, and poke holes in the bottom with a fork to release steam and keep the pastry from puffing up. Bake in a 450°F oven for 12 minutes, or until golden brown. The crust is then filled with your choice of flavors of the cream filling and covered with a meringue topping. The unrolled dough can be stored in the refrigerator for a couple of days before using, or the rolled pie crusts can be frozen in the pan (either before or after baking, it doesn't matter) to be used several days later. Beat the egg yolks in a small bowl and set aside. In another small bowl, sift together the sugar and flour. Scald the milk in a medium saucepan (that is, heat it to the point that it is bubbling around the edges but not boiling). Reduce the burner to low heat. Using a whisk, add the dry ingredients to the milk, making sure to break up any lumps. Being careful not to scorch the bottom, stir continually over low heat several minutes until thickened. Remove from the heat. Add a couple of generous spoonfuls of the hot cream mixture to the beaten egg yolks and mix well. (If you add the egg yolks directly to the hot mixture over the burner, you'll end up with scrambled eggs.) Stir the egg mixture into the cream filling in the saucepan, and then add the vanilla and the butter, stirring until the butter is completely melted. Spoon the cream filling into the baked pie crust. For a light chocolate pie, add 3 tablespoons cocoa powder with the flour and sugar in the basic cream filling recipe. For a richer chocolate pie, add 4 tablespoons cocoa powder. Add 1/2 cup shredded coconut to the cream filling before spooning it into the pie crust. 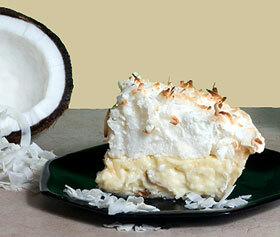 Sprinkle a small amount of coconut as garnish on the meringue before toasting. Add 2 medium, fully ripe bananas, mashed, to the cream filling before pouring it into the pie crust. In a mixing bowl, use the highest setting of the mixer to beat the egg whites and cream of tartar several minutes until the meringue is glossy white and forms stiff peaks. With the mixer continually beating the whites, gradually add the sugar and allow it to dissolve. Spread the meringue over the cream filling, being careful not to mix any of the cream in with the meringue. Also, be sure to spread the meringue so that it touches the edges of the pie crust with no gaps between crust and meringue. If you miss a spot, the meringue will pull away from the crust and shrink into the middle of the pie. One of my aunts can testify to the truth of this warning -- she once had a meringue go afoul, and it ended up as a softball-sized blob in the center of her pie. Another word from Mimi about making meringue. She says it is best to let the eggs set out of the refrigerator and warm up to room temperature before separating them. Cold egg whites don't rise as well as room temperature ones. Place the eggs in a bowl and cover with lukewarm water, and by the time you've made your pie crust, they should be the right temperature. Also, don't allow even a drop of the egg yolk or any type of "fat" to get into the egg whites, or they won't rise into a meringue. Place the pie in a 350°F oven for 12 to 15 minutes to toast the meringue until it is light brown on the top.